Mommy Gossip: What's On Your Nightstand? 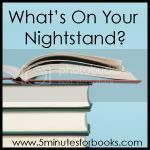 Great info about "what's on your night stand." I'm reading "Nineteen Minutes" right now. Thanks for your compliment on the "divine" fruit salad. Honestly, there's no big, awesome secret :-) But, I will say that the "jagged edge" decorating knife I used to carve around the edge of the watermelon was purchased at Pampered Chef. It was one of those things I thought I'd never use - but, I did! Don't you love "In her shoes" blog? Rachel is a great writer! Oh, The Bean Trees. I LOVE that book! Drop whatever housework you are doing right now and read that book. My favorite. Of course, it must be followed up with Pigs in Heaven, its sequel. I used Simply Fabulous Designs (http://lenatoewsdesigns.blogspot.com/). Her designs are completely free. They're a little difficult to set up b/c right now they are only compatible with Firefox, but I was able to view the code and extract the html codes for the backgrounds and header, which enabled me to add them to my own background. I read The Poisonwood Bible years ago and don't remember much except that I enjoyed it. Probably worth another read! I read Poisonwood Bible a few years ago. Was it an Oprah book, maybe? Anyway...it was a good one! Poisonwood Bible is one of my all-time favorite books. LOVE IT! I also love how the author writes from the different perspectives of the family members. Did you notice that she never wrote from the Father's point of view? I havent' heard of the bean trees before, thanks for the recommendation. I'll have to check it out. Next on my list is The Last Lecture. I am so guilty of reading to the detriment of other things in my life...cleaning, cooking, playing with my daughter (that one makes me feel really bad!). I loved the Poisonwood Bible and just heard of another one by Kingsolver that I want to try. Thanks for the inspiration! Thanks for visiting my blog today, too! I've only read Kingsolvers Animal, Vegetable, Miracle - not any of her fiction, so don't be feeling bad for your inexperience ;). I just read almost this exact same post on the carnival. Someone else read Poisonwood then bought the others. Funny! A kindred spirit. I loved this book so much I wanted to name my daughter Ruth May, but my husband refused even before I told him about the snake. I have tried to read this one a few times, but just can't get into it. I think I'll have to pick it up again when my pile is gone. (Oh my, but that sounded personal, didn't it??? lol) My BOOK PILE, people, BOOK PILE! I never did read this, but maybe now I will. Lovely review.